The company has now gained 32% year to date as investors bet on streamlined operations returning to profitability. 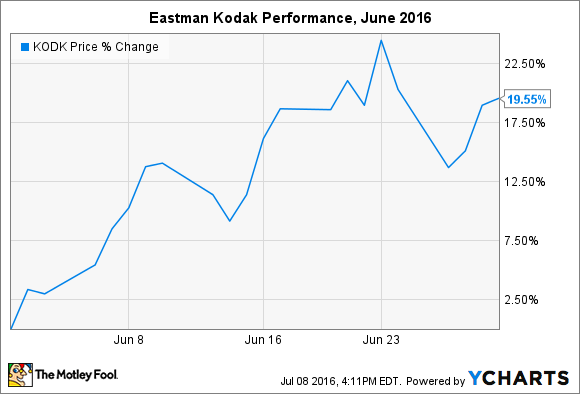 What: Shares of Eastman Kodak (NYSE:KODK) continued their rapid ascent for the year after climbing 20% in June. The company's stock has risen 32% year to date, and 90% since January 19, as investors regain confidence in the turnaround story. So what: Eastman Kodak reemerged as a publicly traded company in late 2013, but investors were hardly jumping at the opportunity to own shares. After peaking in the mid-$30 per-share range in early 2014, the stock zigged and zagged its way to below $8 per share this January. Although the company is still not profitable, investors were, and are, beginning to have faith that management is getting the business back on track. Investor confidence was rewarded after first-quarter 2016 earnings showed a major improvement. Net loss for the quarter was just $18 million compared to $58 million from the year-ago period, while EPS improved from a loss of $1.38 in 1Q15 to a loss of $0.43 in 1Q16. Not a bad start to the year. Things only got better in June. Eastman Kodak announced two strategic partnerships with software companies PerfectPattern and Komori. The partnerships aim to improve print workflow for customers by cutting costs, increasing throughput, and enhancing quality with automated solutions. At the end of the month, Eastman Kodak presented at drupa, a print-media industry trade fair, and launched an e-commerce company called eApeiron, which was created from former assets owned by the company and with investment from Alibaba Group. Eastman Kodak stands to benefit both directly (from a new R&D partnership) and indirectly (from an equity stake in the upstart) from eApeiron's success. Now what: It's easy to write-off Eastman Kodak. After all, the world is increasingly digital, so printing shops may appear to have little value. But high-quality printing isn't going anywhere, and will continue to rely on leaders in the field. Of course, although Eastman Kodak is on the right track, it has a long way to go before it reaches profitability, and still carries an enormous amount of debt.